If it's Ed, why is it also me? Ed's voice is internal. Sometimes, he even sounds like me. I mean, it seems like I'm the one saying restrict, barf, run, take pills, etc. Yet, I know it's my illness. Then again, I don't know that I think I know. See, here's the thing: is my eating disorder a choice or an illness? I am firmly of the belief that it's an illness, as are my OCD and mood disorder*. So it's an illness. Those thoughts aren't me. They're not representative of who I am. It would be the same with schizophrenia- a person who hears voices or has paranoid thoughts might not be able to understand that it's a psychiatric phenomenon and the CIA really isn't after them. Time and perspective (and meds) help, though. I think part of the other difference is that the eating disorder thoughts are so freaking common in the general culture. If I say, "God, I'm fat today," most women will take a look at their own butts and say "No, you're not. I'm fat today." And so on. It totally reinforces the fact that what I'm thinking isn't all that out of the ordinary. However, even I knew I had begun to crack when I had the Sweet N Low folks on the phone and were screaming at them for false advertising because those little pink packets did, indeed, have a fraction of calories. I still feel bad for that lady. My understanding of the ED voice was improved a day or two ago as I worked on the first of my books from my reading list. 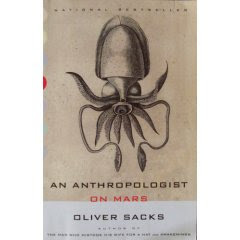 The said book was An Anthropologist on Mars by Oliver Sacks. One of the essays was about a surgeon- named Bennett- with Tourette's Syndrome and his views about living with the illness. "I don't think of it as a disease but as just me. I say the word 'disease,' but it doesn't seem to be the appropriate word." It is difficult for Bennett, and is often difficult for Touretters, to see their Tourette's as something external to themselves, because many of its tics and urges may be felt as intentional, as an integral part of the self, the personality, the will. It is quite different, by contrast, with something like Parkinson's or chorea: these have no quality of selfness or intentionality and are always felt as disease, as outside the self. Compulsions and tics occupy an intermediate position, seeming sometimes to be an expression of one's personal will, sometimes a coercion of it by another, alien will. These ambiguities are often expressed in the terms people use. Thus the separateness of "it" and "I" is sometimes expressed by jocular personifications of the Tourette's: one Touretter I know calls his Tourette's "Toby," another, "Mr. T." By contrast, a Tourettic possession of the self was vividly expressed by one young man in Utah, who wrote to me that he had a "Tourettized soul." It was long complicated paragraph, but when I got done reading it, all I could think of was, "Holy crap! This is me! This is just the way I feel about my eating disorder!" It makes sense. It completely makes sense. I was always under the impression that I could control my eating disordered behaviors. And there was a yes and no to that. Physically, I could eat. Mentally, not so much. In treatment and at home, I still had to make the choice to eat, to pick up the freaking fork and put it in my mouth. But the choice was easier: eat, or sit at the table until you finish. Ed still goes yakity-yak a lot. Just yesterday I was sitting in the car, finishing up my snack, when my mom went back to grab something she had forgotten in the house. So there I am, just me and my string cheese and a garbage can about 10 feet away. And it was then, in that split second, that I heard Ed: "You don't have to eat that, you know." I said: You know what, Ed? You're exactly right. I don't have to eat this. But I'm going to. *They can't quite seem to decide whether I have some form of bipolar disorder, or just major depression and really moody. ::shrugs:: It's basically the same, really. It's very good at manipulation, making you think you are the one who's in charge when you feel like relapsing big time, isn't it? No doubt it/ED will tell you we are all blind as bats and are simply jealous. More lies. Do you have any idea what some of us mother's would do to him if we heard you being talked to with such obvious lines, working on your weaknesses? He'd be running for the hills. If the voice goes against everything you know to be true, even if it's very little right now, then you can bet it's ED and his warped sense of humor.It's TRUE that food is nourishment and not eating is starving.Perhaps you can think of him as a bully sibling who made you eat dirt and now you've broke free. Only you still hear them calling, "come on, I won't hurt you this time". DO NOT TRUST IT! Don't answer him! Cut him loose. This bully doesn't give a darn about you. He can't stand you eating. He can't stand others who he feels won't mind their own business and go away. He knows when the guard is down but you are getting stronger than him everyday. You Carrie, are the one who's choosing to eat. I hope soon you choose to INVALIDATE him and his every word. I think it's normal to be depressed during recovery and it takes time and work to learn how to move through it. My daughter felt like she had been depressed for several years! She needed make some changes to basic thought patterns before she could begin to leave it behind. Your body chemistry is changing fast but has your thinking changed? Many people hide their misery behind a happy front but they still feel have a need to get back in the race. I know my daughter used to be very competitive so she had to redefine who she was competing against...the world or herself. She decided to start enjoying her own company ('fake it till I make it', helps) and she started having some fun. She started playing for fun, not for the win. She extended her schooling to finish her senior project her way rather than feel pressured. She stepped out of the race and won the war. She still uses her perfectionist standards for some things. Still, she had to change her own thinking to ban bullying against herself in her own head.This helped alleviate the depression. With most ED's "I think" that it becomes an agreement with the messages that sinks you. Do not agree and do not engage in conversation. Do not fight with it. Walk away. Ever hear that you don't argue with an idiot, because those watching might not know the difference? Well, ED's an idiot! It's so unworthy of your time and energy. Gotta shut that door in his face! The one person I know with severe schizophrenia KNEW beyond a doubt that the voice was part of a disease. He recalls the day it said "HELLO". It was uninvited though and not intertwined with his own thoughts at all. Still, he needed to find the proper meds to shut it up because it was a different voice and very disturbing. He could talk about it and he wanted help. Yet, when it was bad he suffered for it and it STILL didn't shut up. Like ED, unrelenting. It really took the right meds for him, and this is tricky, but a good Dr. knows how to help find the right combo to shut the voice up. He is still on it today but will probably always need to have it tweaked.There are side affects but he knows there isn't room for 2 in his head. You WILL get through this! Keep walking my friend! with "Dr" Connolly (sorry Pammie, I am impressed with the amount of work you've done for your qualification but I'm not impressed with the science behind it) implying (possibly quite justifiably) that Fry was more depressed than bipolar.